Earlier this month Terry and I did the road trip to see his parents. They live on Lava Bed Road near Diamond, Oregon; Google Maps figured this was 319 miles from us, and would take 6 hours and 47 minutes. Of course, we took a different route, one that included stops at a Latino grocery near Woodburn, an ice cream shop and a used book store in Sisters, and at Costco in Bend. It took us more than ten hours. During our stay we celebrated a birthday (Dovie Jess, Terry’s mom). We visited Martin and Andrea (she’s Terry’s sister), and I photographed nearby Hatt Butte, which is pictured (in 1940) on the cover of The Oregon Companion. We made a most-of-the-day drive up Steens Mountain past Whorehouse Flat (primly, and briefly, rechristened Naughty Girl Meadow by a federal agency several years ago) to the summit, and then back along Big Indian Gorge (the view still dimmed by smoke from the range fires). We had a bountiful steak dinner at the Diamond Hotel just before it closed for the winter. Our return route was 412 miles, plus a few side trips. We poked through the wizened town of Crane, where Terry went to boarding high school. We found the nearly-lost monument to John Devine (1839-1901). 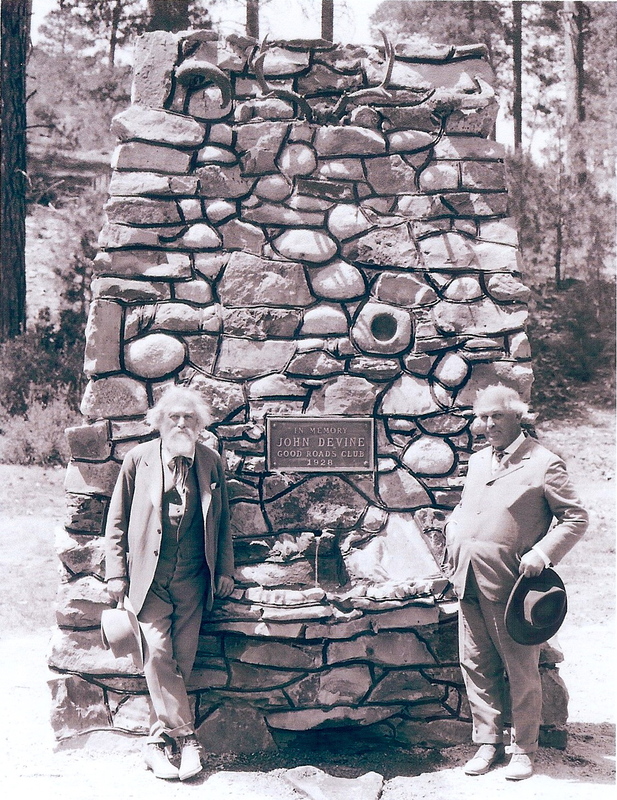 Poor John: Harney County’s first cattle rancher (1869), founder of the famous Whitehorse Ranch and namesake of Devine Canyon, was memorialized in 1928 at this cairn along the road through the canyon, connecting Burns and John Day. Pictured is fellow latter-day cattleman Bill Hanley (1861-1935; at right) and Hanley’s good friend, the poet/soldier/lawyer/artist/rake C. E. S. Wood (1852-1944). And see what it looks like today. We almost missed it. We stopped to see the solitary wigwam burner in Seneca, and in John Day to consume an immense lunch at the Snaffle Bit. We went through the new Thomas Condon Paleontology Center at the John Day Fossil Beds National Monument. Then we went to Mitchell (population 175, about 35 less than it was in 1910) where we found a plain but very cozy room at the Hotel Oregon and a plain but very cozy spot for dinner next door at the Little Pine Café. The next day we took a peek at the ghost town of Richmond, walked about in the fossil-filled palisades at Clarno, and then had a superior homemade meatloaf sandwich while chatting with an odd cast of characters at the Antelope Café in downtown Antelope (this was for a short time the Zorba the Buddha Restaurant, in downtown Rajneesh). We loped home via Shaniko, Bakeoven Road, Maupin, and Pine Grove.